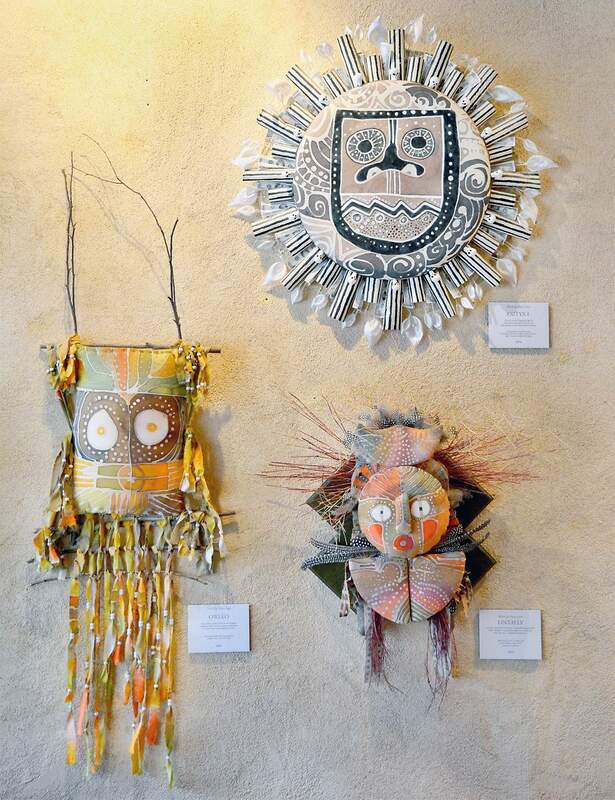 From left, Dian Law’s mixed media creations such as “Owleo,” “Exityx I” and “Lintally” make for a unique dining experience at OLIO in Mancos. An olio is a Spanish stew, a meaty hodgepodge specialty from the northern Castilian town of Burgos. In Mancos, the restaurant OLIO is a stew of local food, fine wines and contemporary art. Opened under the direction of chef Jason Blankenship, OLIO hosts a local artist once a month. The walls are adorned with the mixed media and fabric art of Dian Law. For Law’s opening Saturday night, she brought together a collection of work spanning the last decade, including a piece she has been working on for nearly as long. In an almost Shakespearean sense, Law uses gods, sprites and mythological figures to give meaning to our own stories and problems. Her work is most certainly tongue-in-cheek, even when dealing with complex issues such as war. “I really love to tweak the foibles of humans – what we worship, what’s important,” Law said. A combination of batik designs, found objects and quilting, Law’s work is meticulous, yet unrestrained and wonderfully debonair. Law’s deities are smart, witty and at times ,mischievous – making the show refreshingly insightful and captivating. “Fathers & Sons,” an ornate mixed media piece, depicts the futility of war across cultures. In three female-centric pieces, Law scrawls quotes from the Old Testament across the batik designs. In perhaps one of her most complex works, “Wall of Secrets,” Law uses a mix of fabric and found objects to represent the secrets hidden within us all. Law, who moved to Mancos eight years ago, is the President of the Mancos Valley Arts Council and the arts columnist for the Mancos Times. Formerly a graphic designer, Law has worked extensively with fabric arts since the 1980s. With the doors thrown open to welcome in the cooling autumn air, OLIO proved to be the perfect venue for Law’s work. The elegant, tastefully appointed space is unassumingly located between two galleries on Mancos’ small, yet thriving Grand Avenue. Formerly owned by Rena Wilson as Arborena, Blankenship took ownership in June. Wilson now helps run the space and select artwork for the monthly shows. “I try to keep contemporary art (in the space,)” Wilson said. “It’s a wonderful way to liven up a wine bar,” Blankenship noted. Since June, OLIO has hosted shows with bronze artist Dimitry Domani and Susan Reed. Nick Blaisdale, of Dalton Ranch Pottery, is regularly on display. Next month, OLIO will hold a two-person show with Mark Montgomery and Barbara Grist. Formerly trained in Dallas, Blankenship worked as a chef at Kennebec Cafe until recently. Upon opening OLIO, Blankenship expanded the menu from the limited offerings of Arborena to include a full dinner and desert selection. Only 30 minutes away, OLIO’s quietly upscale atmosphere wouldn’t be out of place in any major city, but its location in Mancos makes OLIO all the more charming. For Mancos’ ever burgeoning arts community, OLIO adds a splash of the exotic. Mixed media works by Dian Law will be on display through September at OLIO, 114 W. Grand Ave. in Mancos. Hours are 4-9 p.m. Tuesday through Friday and 1-9 p.m. Saturday. For more information, call 533-1381.